1.) Once you have removed the grill area from the vehicle. Clean the area properly so that there is no dirt. Lay the LED strip lights onto the grill, once you have found the best spot, remove adhesive cover and lay onto grill. 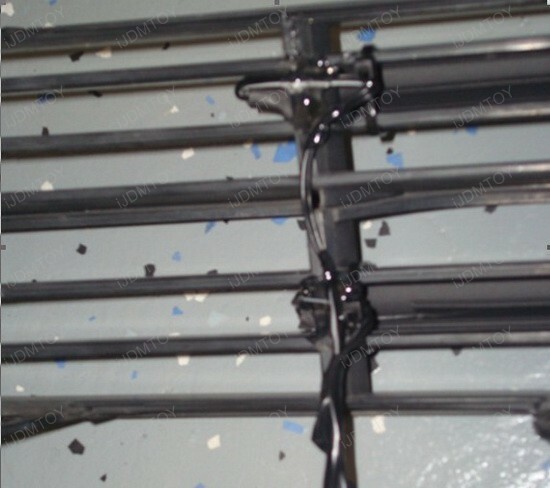 Use a heat gun or blow dryer on the LED strip lights to allow the adhesive to properly adhere to the plastic grill. 2.) Route the wires to the headlights of the vehicle. We recommend using silicone sealant on the edge of LED strip where the wires are to completely cover any exposed circuitry. 3.) Ground the negative wire of the LED strip lights to bare metal of the chassis (extra electrical hardware may be required). Route the positive wire to a power source you want the LED's to turn on with such as your parking lights. 4.) Once everything is connected, test the LED strip lights to see if they work. Once you confirm they are working, re-install everything in reverse order and enjoy your new LED strip lights!